I don’t have many vices but I think baklava is one of them. I have never been satisfied with a piece or two, I always have to devour it until there is nothing left. To avoid gaining back the 40 pounds I worked so hard to lose, I have learned to only make it only when there will be other people to help me consume. This recipe is similar to the one my mom always uses and is a bit unconventional. 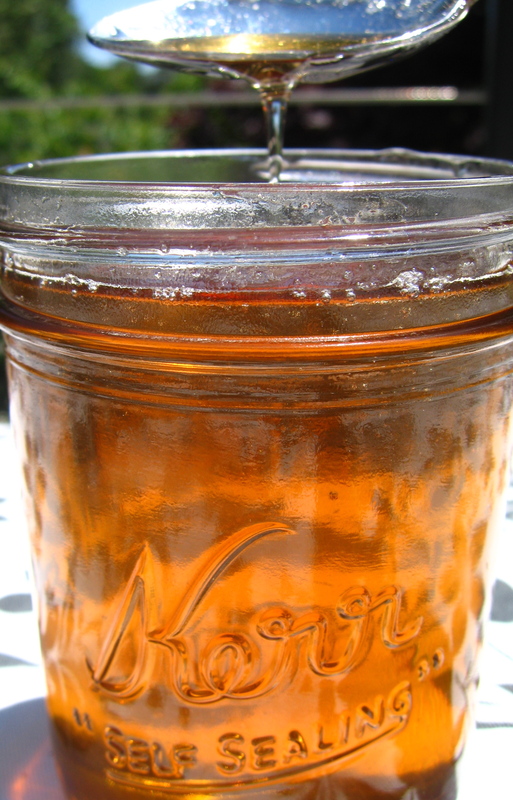 I usually can’t stand the taste of whiskey, but it is the secret ingredient in the syrup that makes it taste amazing. I provided measurements for all the ingredients below, but you can adjust everything to your taste. Please leave a comment if you try this recipe, I would love to hear what you think of it. Boil all ingredients in a medium saucepan until thick, about 15 minutes (it should reduce down to about 2 cups). Remove from heat and set aside while you prepare the pastry. Pulse nuts and cinnamon in a food processor until coarsely ground. Heat Earth Balance with almond milk until melted. Line a large baking pan with foil (heavy duty is best). The pan needs to fit the larger dimension of your phyllo sheets and needs to have raised sides because you will pouring the syrup in it. I use a 17″ x 11.5″ x 1″ pan. Brush the foil with melted EB. 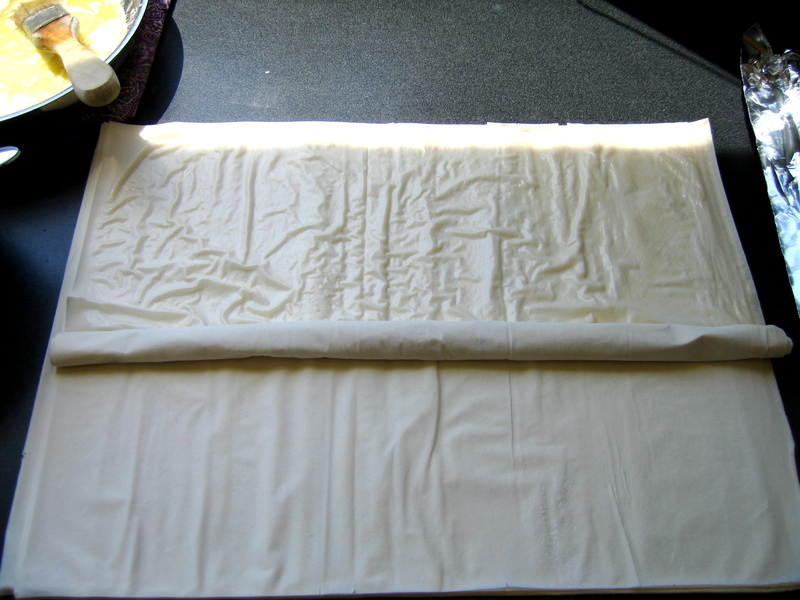 Unroll phyllo onto a clean and dry work surface in a “landscape” orientation. Take care when working with phyllo as it is prone to tear. Using a pastry brush, apply a light coating of EB to the top phyllo sheet. 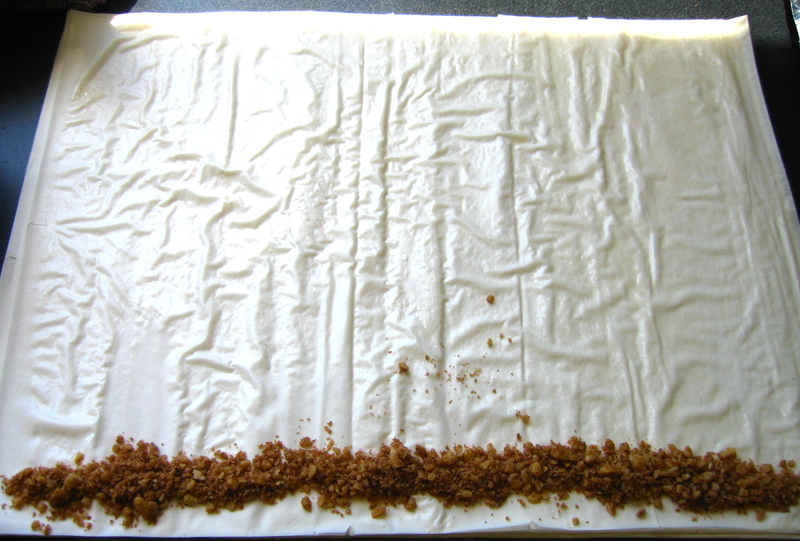 Use a spoon to make a narrow row of nuts along the lower edge of the phyllo. Loosen the lower edge of the top 2 sheets of dough and roll phyllo into a long log. Place in prepared baking pan. Continue this process until the rest of the phyllo is used. Brush the tops of the baklava rolls with EB and bake for 20-30 minutes, until golden. Promptly remove pastry from oven and pour syrup in pan. Allow baklava to soak for at least 1 hour. Remove the ends and cut baklava into 3″-4″ segments and serve. If you have any leftover nuts, you can sprinkle them on top.